To help support the efforts of Chabad, and to enrich our entire community, we have created the Chai Club and are inviting you to become our partner. Each month - on Shabbat Mevarchim - there will be a special Farbrengen at Chabad for the whole community. As a member of the Chai Club, your donation, combined with everyone else’s in this special club, will allow us to reach out and unite like never before. How do I Join the Chai Club? 1. 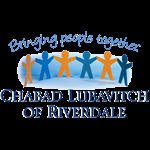 You can pledge $18 each month to Chabad of Riverdale. You can submit your contribution here, and include in the Payment Information field that the donation is for the Chai Club. If you would like to make a monthly contribution, you can select on the Donation page that you would like this to be a recurring payment. 2. Alternatively, you can bring a pre-approved, wrapped, unopened food item. 1. All items must be pareve in sealed packages with an acceptable hechsher (OU, Circle K, Star K, Chof K). 2. Cookies must only be Pas Yisroel and Parve. 3. Please do not bring bread or pitta. Any corn and rice chips that are OU and pareve can be brought in. With regard to potato chips, only those manafactured by a frum company, such as Paskesz and Liebers. Veggie hummus, salsa, lox, herring, avocado, fruit (no berries), small peeled carrots in bag, parve popcorn, Mary's Gone Crackers (Gluten free - Costco), whitefish salad, guacamole. Again, if you are unsure of any item, please check with Rabbi Shemtov before purchasing. We are so happy to have all our friends participate. Thank you!